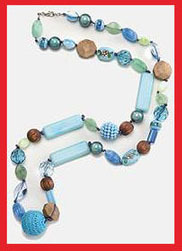 Great American Jewelry is a trusted source for adult fashionable jewelry. We distribute prepackaged, mixed assortments of earrings, brooches, bracelets, necklaces, rings and seasonal jewelry. Much of our product is branded closeouts from easily recognized national mass merchants, retailers and specialty stores. Our primary customers are independent dollar stores and dollar store chains throughout the US, as well as off-price merchants and thrift stores. However, our special value merchandise can be sold for more than a dollar. We accept all major credit cards. Terms may be arranged. Many items are ticketed with retail prices that far exceed prices charged by dollar stores. These items are closeouts. Styles change frequently based on availability. We are continually adding new items. Minimum orders are 24 dozen assorted merchandise. You may mix and match items. Most orders are prepackaged in units of six-dozen assorted styles of a single item (Example: six dozen assorted bangle bracelets to an order) Our assortments enable the retailer to order a broad mix of product without incurring substantial investment.